It is finally here! After a cold winter offseason that seemingly dragged on for years- thanks in no part to marquee free agents Manny Machado and Bryce Harper deliberating and keeping fans guessing on their next destination for a decade, we are all set to play ball. The Boston Red Sox are the defending champions, after an astonishing 2018 campaign which saw them win a franchise best 108 regular season games en route to winning their 9th World Championship. Of course, in March only the future matters, and what happened last October is sent back to the memories of the sport. With this in mind, we take a look at how each division looks for the upcoming 2019 season. The division with the biggest rivalry in baseball- the New York Yankees and the Boston Red Sox, also is arguably the most competitive division at the helm, with the aforementioned powerhouses leading the betting. Interestingly enough despite the Red Sox recording a 108 win season, as well as defeating the Yankees 3-1 in the ALDS en route to winning the World Series, the New York Yankees have been installed as 10/13 favourites to win the AL East, with the Red Sox a juicy 5/4 to win their fourth straight division crown. We believe that there is far too much value to be had on the reigning World Champions, who had one of the best seasons in MLB history in 2018, and considering that Boston has retained largely the same core from their championship run, at 5/4 they start our futures MLB bets with some very nice value indeed. The Tampa Bay Rays are an interesting team, as they quietly pulled off a 90 win season last year, despite being just one game above .500 after July. The Rays went on a tear during the last two months of the 2018 season as they went 17-10 in August and 19-9 in September. Their season wins total for 2019 is set at 84.5, and considering how well Tampa Bay was playing towards the end of last season, we believe it is worth a punt on the Rays to win over 84.5 games this year, as they won 90 last year despite essentially playing .500 ball for the majority of the season. At 1.25 (1/4) the Indians are almost a lock to win their fourth straight AL Central crown, with the Minnesota Twins being the only competitor (3/1) shorter than 25/1 in the betting. Obviously this represents little to no value, especially considering that this market won’t be settled until October, so we head into the team totals market to find some value here. The Twins team total is set at 83.5, and we believe that whilst the Indians will probably once again win the division, the Twins picked up some familiar faces in the offseason, such as the likes of Nelson Cruz and Marwin Gonzalez, to partner their promising young core featuring Miguel Sano, who should play the majority of the season and Byron Buxton. Coupling this with the weak schedule the Twins will play, due to the luxury of being in the AL Central, we fancy the Twins to win at least 84 games this year. At 1/7 the Astros are an extremely short price to win their third straight AL West crown, after winning over 100 games in each of the past two seasons. Once again that is far too short a price to be betting on a futures market, so we take a look at the team totals market to find some value. The selection that draws the eye here is the Astros themselves winning over 96.5 games. Houston won 101 games in 2017 en route to a World Series victory, followed up by a 103 win season last year, only scuppered by the eventual World Champion Boston Red Sox in the ALCS. Considering the strength of this team featuring several star players, both at the plate and on the mound such as Jose Altuve and Justin Verlander, we believe Houston will have a very strong season once again in 2019 and considering how well they have done in recent regular seasons, this total seems a little on the low side, even at 96.5. We have the Red Sox, the Indians and the Astros winning their divisions respectively, although the Yankees are actually joint 14/5 favourites for the pennant. 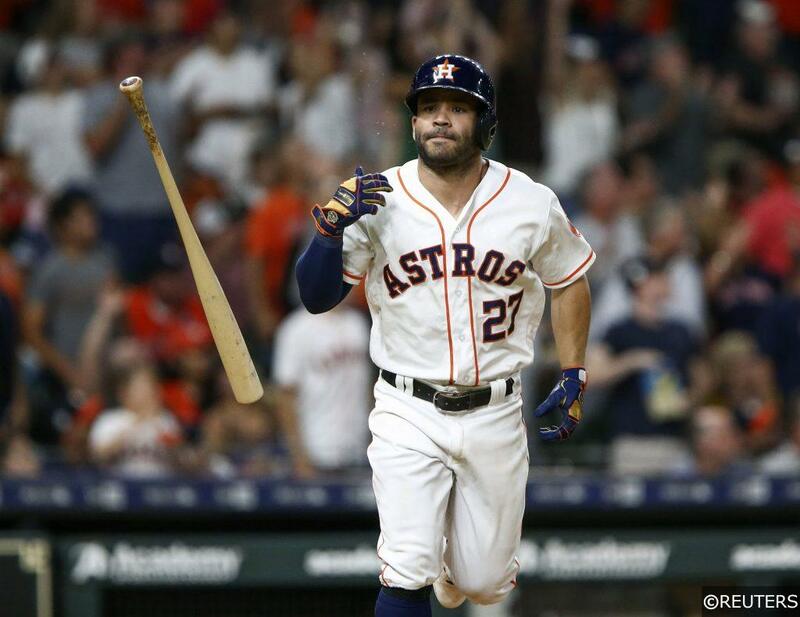 We believe that at 14/5 the Astros make for a good bet to win the American League, as being installed 1/7 favourites for their division title, Houston should have relatively little trouble in claiming an automatic spot in the ALDS, as well as a good chance at securing home field advantage throughout the American League playoffs. This is a roster loaded on both sides of the ball, and will be looking for their second American League pennant in three years, as well as their third consecutive trip to the ALCS. Onto the National League now, and we start with arguably the most competitive division in all of baseball with the Mets being the fourth favourites (second lowest) to win the division, yet still being a fairly skinny 10/3 to do so. The Atlanta Braves won the division crown last year with a 90-72 record behind an impressive young core, and are 5/2 to do so once again. The Washington Nationals were the odds on favourites to win last year’s division title, but finished a never closer second place with an 82-80 record. However this is a considerably weaker Nationals team, after losing star players such as Daniel Murphy, and Bryce Harper- the latter who remains in this division, but will be playing for the Philadelphia Phillies for the next 13 years. Speaking of the Phillies, they were top of the division last season as late as mid August, but following an embarrassing 8-20 September record the Phillies finished in third place with a 80-82 record. However this is a drastically improved Phillies team, who have strengthened in several positions this offseason acquiring established players such as David Robertson, Jean Segura, Andrew McCutchen, JT Realmuto, and of course Bryce Harper- all of whom have been at least a one time all-star. At a healthy 9/5 we believe that the Phillies are a strong value pick to win the division this year, after challenging for the title for much of last season, despite having a far weaker roster. You know that it’s a competitive division when the favourite is a 21/10 shot to lift the crown, with the “outsider” of the five teams 15/2. At 9/4, we like the Cardinals to win the division this year. Boosted by offseason acquisitions of star first basemen Paul Goldschmidt and reliever Andrew Miller, the St Louis Cardinals are in prime position to launch an all out assault on the NL Central title race, adding to their already competitive roster featuring the likes of Matt Carpenter and Dexter Fowler. Whilst the other two National League divisions are arguably the most competitive in all of baseball, the National League West alas is not, seeing the Dodgers posted as the 2/9 favourites, with two 35/1 and 40/1 outsiders respectively. Therefore we once again turn our attention towards the team totals market to find some value. The Diamondbacks season total is listed at 74.5, and aforementioned traded star slugger Paul Goldschmidt, as well as losing ace Patrick Corbin and starting centre fielder AJ Pollock to free agency. This leaves Arizona with a depleted roster, and with the inflated price of 11/10 on the under here, it is worth a punt on Arizona to struggle in 2019 and win under 74.5 games. We have the Phillies, Cardinals and Dodgers winning their National League divisions respectively, and at 5/1 we believe that the Phillies are good value to advance to the World Series and win the National League pennant. The Phillies played decent baseball for much of last season, and have improved in abundance during this offseason. Whilst arguably more competitive throughout, the National League isn’t as strong at the top as the American League is, paving the perfect opportunity for this fresh look Phillies team to play on the World’s biggest stage. The Houston Astros vs the Philadelphia Phillies. What an intriguing matchup this would be, pitting a team who used to struggle, that has since become perennial playoff features, including winning a World Series in 2017, against a team which was nothing short of spectacular going to back to back World Series in 2008 and 2009, but has struggled in recent years, not making the playoffs since 2011. We believe that the recent playoff experience will give the Astros the edge in this one, as they win their second World Series crown in three years. We believe that the Phillies will have a great season, but this Astros team is full of stars, at the mound, on the plate, and in the field and have a great chance of lifting the World Series trophy come October. Categories: Baseball, Blog, and Season Outright Tips. Sports: Baseball.